Many units have fully equipped kitchenettes including cook tops. 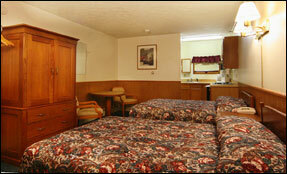 All Guests enjoys use of our large fresh water heated pool and outdoor Hot Tub. Daily maid service is included and we have a washer, dryer in the motel which guests may use. Each unit includes one free parking space (sorry we do not have space for more than one vehicle per unit). Green Dolphin Motel, Old Orchard Beach, Maine.